Water, Water, Everywhere — But not a drop to drink? This year’s drought has thrown California into a sudden tizzy, a crisis of snowpack measurements, fish-versus-people arguments and controversial cuts in water deliveries. But in reality, crisis is the permanent state of water affairs in the Golden State — by design, because our institutions keep it that way. California has 1,400 major dams, thousands of miles of aqueducts and pumps so powerful they lift water nearly 2,000 feet over the Tehachapis. The state uses enough water in an average year to support, in theory, 318 million Californians (and their lawns and dishwashers), more than eight times the actual population of 38 million. Basic economics tells us that a precious commodity should be priced accordingly and directed toward high- value uses. Instead, California does the opposite with its water resources. About 75% of water used in the state goes to agriculture. California is the top agriculture producer in the United States, but ag contributes just 2% to the state’s economic output. Economics also says that rarity promotes efficiency. But nearly half of California farms still use flood irrigation, when using sprinklers or drip systems could save nearly as much water every year as the 9 million acre-feet all 38 million of us use. Many of these farmers have little incentive to upgrade their systems, when water is provided to them at a discount through direct subsidies, interest exemptions, writing-off part of the cost of dams and the use of cheap hydropower from those dams. On top of this, urban ratepayers foot more than their share of water projects that benefit agriculture as well. Worse, when drought crimps surface supplies in rivers and reservoirs, California water users turn to pumping groundwater. The predictable result has been plummeting water tables, land subsidence, skyrocketing well drilling costs and further drying of streams connected to groundwater. The cost to our environment is steep. California’s salmon and steelhead populations are either extinct, endangered or in decline. The Sacramento-San Joaquin River Delta, switching yard for most of the state’s water supplies, is close to ecological collapse because too much water is pumped out of it or is diverted before it gets there. The primary response of the governor and state agencies has been to demand more subsidized mega-projects, while failing to fundamentally reform a flawed and failing system. Instead, California ought to learn from the experience of Australia, the driest continent on Earth, with a broadly similar economy, climate and, until recently, a similarly balkanized and economically irrational water management system. Faced with a 12-year-long drought, which brought fatal brush fires to its cities and devastation to its agricultural communities, Australia’s state and federal governments agreed in 2007 to manage their water “in the national interest rather than on jurisdictional or sectoral based views,” in the words of the federal environment minister. Beginning with Australia’s largest river system, the Murray-Darling basin, planners and scientists now look first to how much water is needed to sustain stream ecosystems, and cap diversions to maintain them. Water quality, salinity and the connections between surface and ground water are all taken into account. Next, water is set aside for the essential needs of human communities for drinking, household use, sanitation and firefighting. Above these baselines, water can safely be diverted for other, economic uses. Cuts to historic diversion levels have been cushioned by billions in government funding to buy water rights from willing sellers and make investments in efficiency such as canal lining, drip and computerized irrigation, and increased water storage. Subsidies have been eliminated, so the full cost of infrastructure is paid by its users. Crucially, barriers to water trading were removed, allowing water to flow to higher-value, more efficient uses, while compensating sellers. Water rights were converted to “shares,” whose amount and value fluctuate along with natural conditions. Farmers with “interruptible” crops, such as rice, which is planted every year, sell water in dry times, while farmers with permanent crops, like orchards, or the most lucrative crops buy it. So far, Australia’s new water market has performed as economists predicted: Even in the worst year of the drought, with delivery cuts of two-thirds, the value of agricultural production remained 70% of normal, according to Mike Young, professor at the University of Adelaide. Initially, water prices soared, but they have since fallen back as farmers and urban users have learned to do more with less. Australia’s cities, already relatively frugal, cut their use by 35% to 50%. 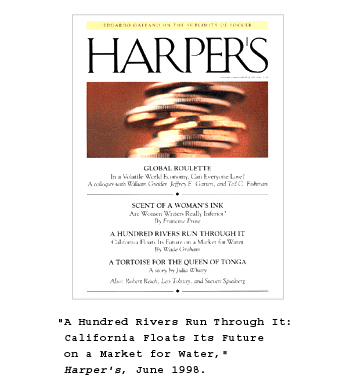 Fearof hoarding by outside investors and market manipulation proved overblown, but California ought to take these potential pitfalls into account in designing its own water markets. As in Australia, drought is normal in California, in one of the most variable climates on Earth. 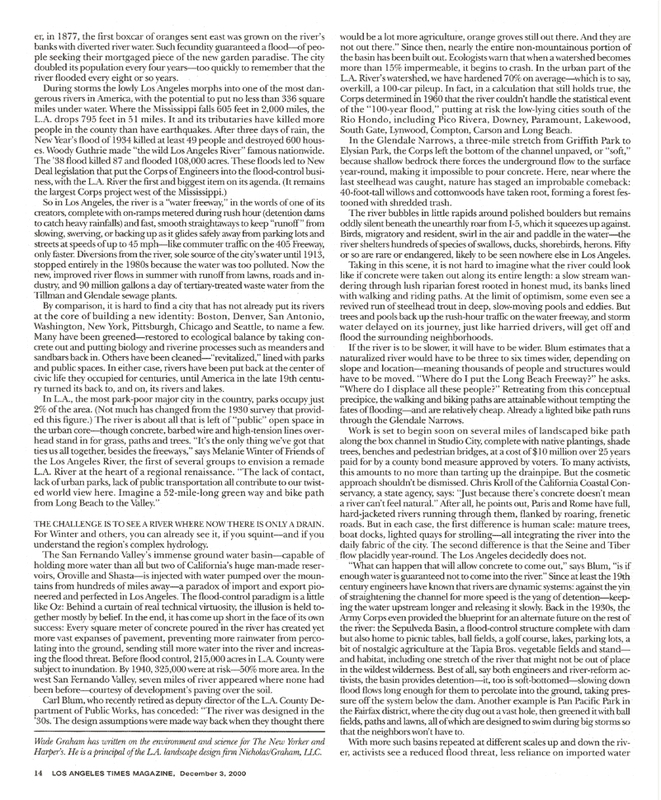 Instead of pursuing unrealistic “coequal goals” of simultaneous environmental health and water supply “reliability” — as mandated for the delta — our water management system ought to be based on adapting to an unreliable climate, protecting our environment and communities first while increasing economic efficiency, and ending, not creating, a state of crisis. The thirst on Earth is building. Is there enough water to go around? With the planet getting warmer and more populated, the trend lines seem clear: the thirst on Earth is building. Is there enough water to go around, and if so, for how long? We spoke with water and climate expert Peter Gleick, Ph.D. in an attempt to find out. You’ve talked about “peak water” in the American West. Can you explain? The concept of “peak water” tells us that even though water is (mostly) a renewable resource, there are limits to how much water humans can use, and we are finding ourselves up against those peak limits in the western United States (and many other places around the world). 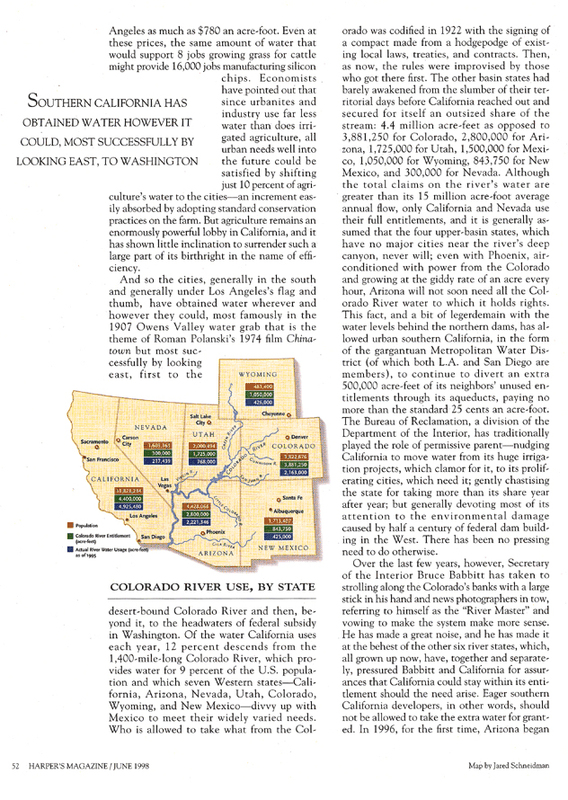 For example, our cities and farms now use the entire flow of the Colorado River. While that is a renewable resource, we can’t get more out than nature provides, and in fact, we’re now realizing that we should have left some in the river for the natural ecosystems. Another example of “peak water” is the unsustainable overpumping of our groundwater and levels are falling in many parts of California—just like overpumping oil. Will building more storage systems like dams solve our water problems? The massive water storage systems we’ve built in the West help us get through droughts and reduce the risks of floods, but they have also caused serious economic, environmental, and social problems that we are only now starting to address. Moreover, there are very few acceptable places for new, traditional storage reservoirs and dams in California. As a result, a water strategy that just relies on new dams and traditional storage ideas is doomed to failure. A few more dams—even if we could find a place (and the money) to build them—would not eliminate or solve the water problems we face. The good news is that there are alternative ideas for “storage” that may prove very useful, including using overpumped groundwater systems to store water in wet years to use in dry years—so-called “conjunctive use.” Let’s stop looking to old thinking about storage, and look to new ideas. Speaking of those overpumped groundwater resources, who can we better manage them? The first step is to begin to comprehensively monitor actual groundwater use. Hard as it is to believe, we don’t monitor or measure all groundwater uses, and as a result, we do not know who is using water, to do what, and we do not sustainably use our groundwater—overdraft is a serious challenge. How much can be gained from water recycling? Another potential new “source” of water is to make far better use of wastewater for different purposes. We can, and often do, treat wastewater to very high standards, and indeed, could produce the highest quality potable water if we wanted, as they are doing today in Singapore and elsewhere. But even lower quality treated wastewater could be considered an asset and used for restoring ecosystems, landscaping, industrial uses, or other purposes. Ecosystems have taken huge hits as users divert more and more water from rivers. What tools do we have to make sure that the life of streams is protected? We must do a better job of understanding the water needs of ecosystems, and then we must develop the laws and institutional tools to guarantee those basic needs, just as we now recognize the human right to water for basic needs. Some progress has been made in this direction in the past few years, but ecosystems are still on the short end of the stick when it comes to water rights and allocations, and all of us suffer as a result. Some 80 percent of water in California is used by agriculture, and half of that to grow low-value crops. How can this be changed without seriously compromising an industry that makes up a large portion of the state’s economy? California is a wonderful place to grow food, and a healthy agricultural industry and communities are vital for the state. In the coming years, one of the most important challenges will be figuring out how to grow more food with less water, by improving the efficiency of irrigation, expanding modern irrigation technologies, better monitoring of water applications, and shifts in the kinds of crops farmers grow and where they grow them. We already see progress with innovative farmers and water districts increasing production with less water. Everyone has heard of Chinatown and knows the basic story behind the Owens Valley. How can the mostly rural areas of California, where much of our water comes, from avoid the same fate—seeing their water diverted away to wealthier, more politically-powerful areas? There is still a major imbalance in political and economic strength that favors large, politically powerful urban areas and irrigation districts at the expense of smaller, more rural areas. Our water institutions must find better ways of recognizing, listening to, and protecting rural areas and the headwaters of our watersheds in order to guarantee reliable and sustainable water supplies in the future. 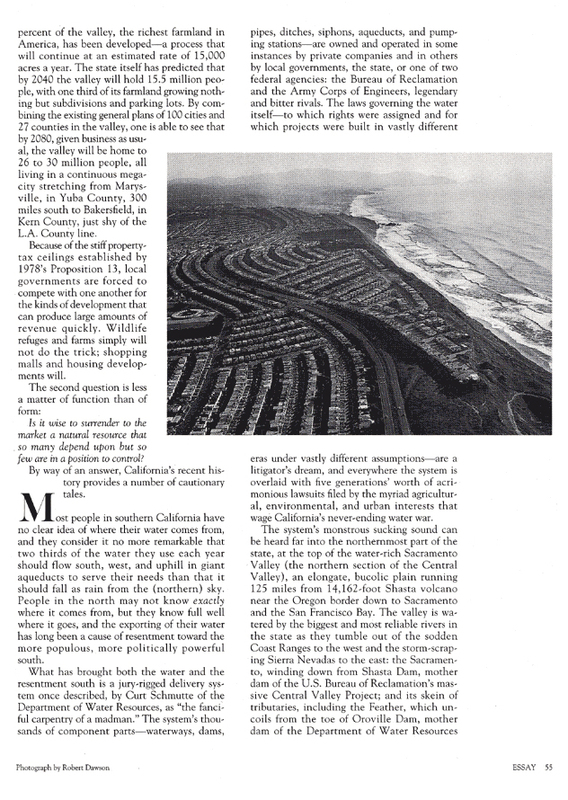 Should the way water is allocated—mostly its rights were handed out generations ago—be changed as we go forward into a different economy, demography, and climate scenario in California? And if so, how? Among the institutional challenges facing California—and much of the rest of the world—are old water laws, institutions, and policies. These are often very hard to change, including, for example, the water rights allocations given out a century ago. Nevertheless, we cannot continue to do business as usual, especially in a world with a rapidly changing climate. We must look to better technologies, proper water pricing, and even limited water markets, ecosystems protections, and the greater involvement of local communities in planning and managing water systems. There are signs that innovative cities and farms are moving in the right direction. The risk is we may not move quickly enough to avoid the coming crisis. A giver of life and a wellspring of strife, the region’s most precious resource will be all the more precious in the days ahead. But even with climate change, population growth, and endless legal battles, there’s reason to be optimistic about the future of water. 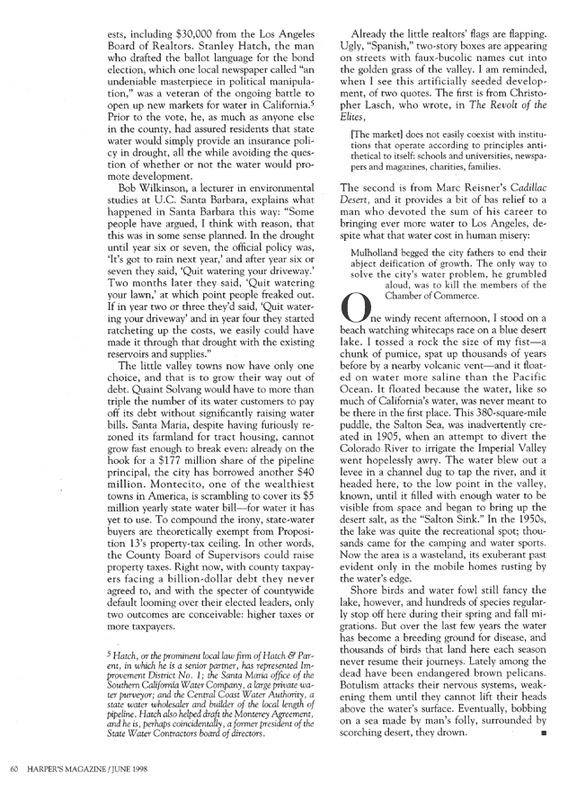 People have always worried about water in California. We’ve been fighting over it for so long, the conflict itself has become part of our landscape. We’ve seen farmers suing miners, fishermen suing farmers, cities suing cities, and other western states suing California—along with one another—to control a precious resource that can seem frustratingly fickle. Wet years marked by torrential rain, mudslides, and floods are followed by shriveling droughts. All the while, enormous rivers flow in one end of the state, far from the enormous thirsts elsewhere. 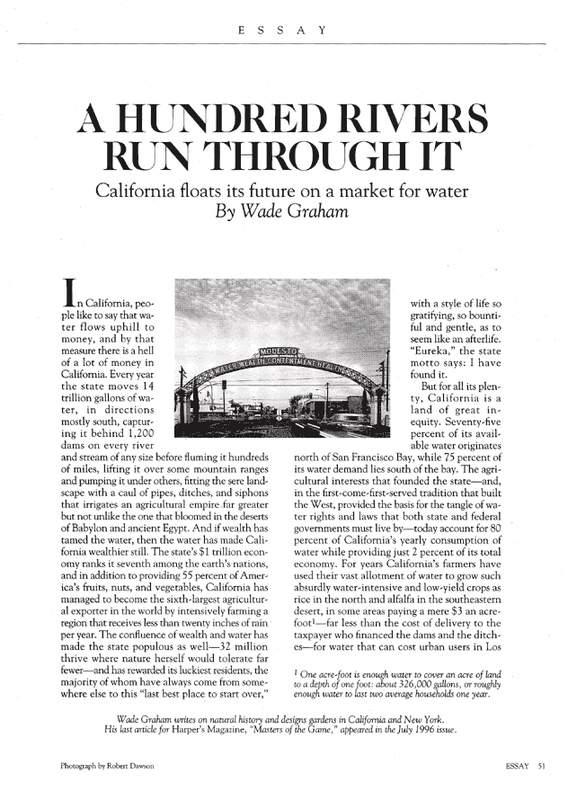 To slake them Californians have built one of the biggest hydraulic systems the world has ever seen—1,400 major dams and thousands of miles of aqueducts to move the water from the north, where two-thirds of the precipitation falls, to the south, where two-thirds of the people—and almost a third of farms—reside. All of it helps underpin a $2 trillion economy, the eighth largest on earth, but it’s done little to nudge the state back from being forever on the verge of a water crisis. As climate change threatens to make California’s ten-year drought the “new normal” and the population is projected to reach 59 million by 2060, battles over water are ratcheting up again. After all, everyone knows water is scarce. But is it? If you were to divvy up the water available in our reservoirs and underground aquifers, there’d be enough each year for 630 million Californians living in suburban homes, each furnished with a lawn and a swimming pool. In reality the 38 million people who do live here use only about 20 percent of that. The rest goes to agriculture: No other state produces more crops—almost all of them requiring irrigation. Water means everything here. Yet from a certain point of view, we have so much of it, we waste it as fast as we can. In fact, it’s the law. 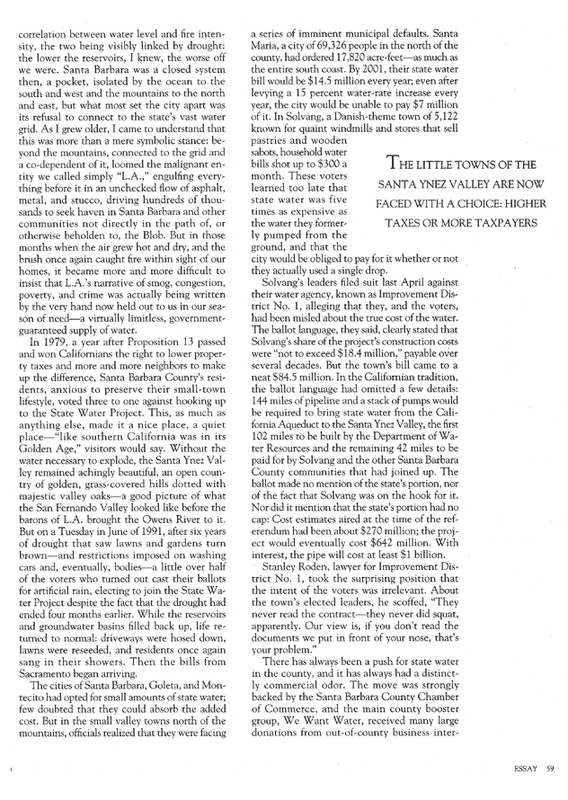 California water law is based on the “use it or lose it” principle, invented in the miners’ camps of the Gold Rush: The first to grab it can claim as much as he can take. If he doesn’t use it, the water “right” can be taken away—which amounts to a perverse incentive to not conserve. What’s more, most water is priced below what it costs taxpayers to supply it. “California is not running out of water,” the nonpartisan Public Policy Institute of California stated in a 2010 report, “but the state will face increasing water scarcity. It is often said that there is not a shortage of water, only a shortage of cheap water.” Many cities, including Sacramento, don’t even have water meters. And half of California farms still practice wasteful flood irrigation—literally submerging a field or an orchard in water—when employing sprinklers or drip systems could save nearly as much water on farms every year as all 38 million of us use at home. But ever on the move, the Golden State has been too successful to slow down and pay much heed to the problems that it has created for itself. Toxic dust storms blow up from dry lake beds, producing some of the worst air pollution in the United States. All but 5 percent of our historic wetlands are gone, replaced with asphalt and polluted runoff. All but a few of our rivers and streams are dammed, devastating fish and wildlife. California’s chinook salmon run was once the third largest on the Pacific Coast. 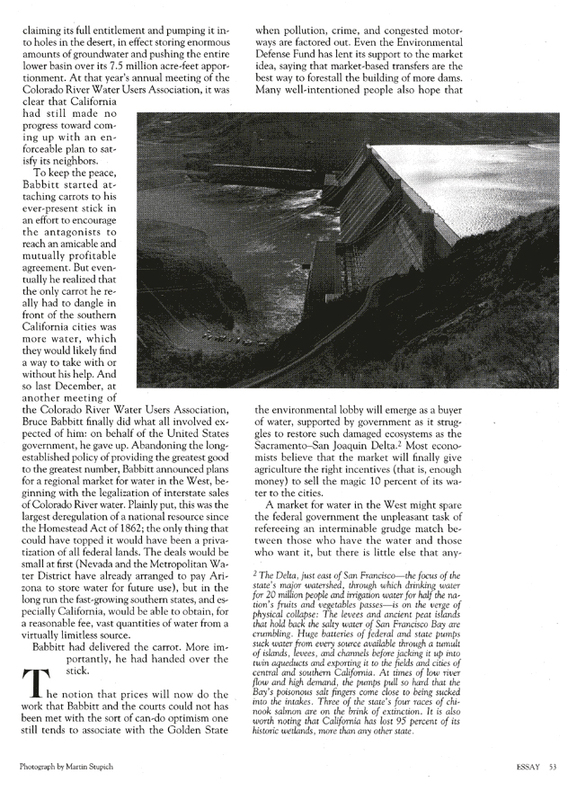 Today it’s shrunk by 98 percent, the fish likely headed for extinction as they leap futilely against the base of dams, among them a 700-foot-high one designed to bring water to L.A.
Our quest for water has been expensive: tens of billions in taxpayer money over the decades, including $19.6 billion in bonds approved by voters since 2000 to clean up polluted waterways, rebuild aging pipes and treatment plants, construct new aqueducts and dams, and remove others that are dangerous or useless. Money hasn’t solved the problem, though, and there are billions upon billions being lined up for other projects—with no guarantee that they will, either. The end is not nigh; California can continue to thrive for our children and their children, but not if we continue to apply a century-old philosophy to handling our most valuable resource. Now more than ever, it pays to know your water.